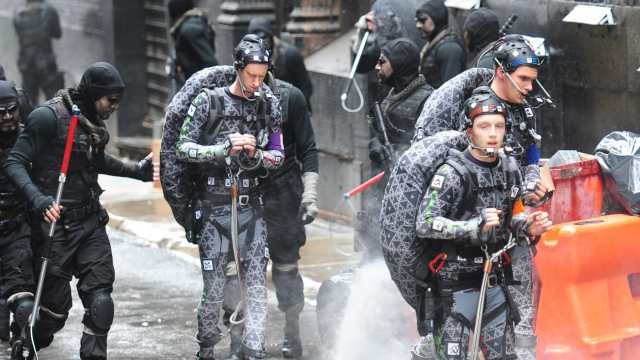 At first I thought I imagined it, but yes, a new TMNT movie -- all CGI -- is coming out in Smarch. PATRICK STEWART is a voice, and I'm a bit disappointed he's not Splinter. SMG = April, and Zhang Ziyi is in it too, as are Billy West, Kevin Smith, and Larry Fishburne. A trailer is available, but I can't see it at w0rk to see if I should churl in anticipation or hurl in cipation. Will this one have Vanilla Ice in it, a la TMNT2? The trailer makes it look ok, actually. Dare I geekily ask if it looks more faithful to the old comics? Yeah, it does a bit. There are 2 trailers, both action packed, one WAAAAY more action packed than the other. Mako as Splinter - his last job. He had the greatest "wise old dude" voice of anyone. Billy West isn't really credited for any particular character, and none of the individual Turtles' voices are credited - could it be that he did all 4 of their voices? It wouldn't surprise me. Man, the first TMNT movie was such a huge disappointment for me -- but for some reason I was hoping it'd be more like the comics than the cartoon, which was dumb of me. I was a pretty TMNT obsessed kid, but never watched any of the movies - felt pointless when the cartoon delivered so much more madness in a less forced environment. Did I miss out? Nah, I don't even think I enjoyed them at the time that much. In retrospect, the TMNT concept does seem to make more sense as a primary-coloured, wacky weekly cartoon for kids, than as a scratchy, violent, over-inked black and white indie comic for der pretentious 14-year-olds. I did like the comic, though. The Rick Veitch issues were alright, I think. TMNT was a lot like the (early)Vertigo of its time, in a way -- it satisfied a lot of the appeal of the superhero genre, without being tied to or attempting to emulate a backlog of forty years of continuity and without being bound by the conventions of that genre. Comic book Webelos, a stepping stone between this and that. But yeah, a lot of the material is well-suited to a cartoon -- I just never got into it because it was aimed younger than me and I wasn't old enough yet to filter that out. My comics-selling friend got me a big pile of the recent Peter Laird-scripted TMNTs, and they were pretty good. It's like the comic has matured but still has plenty of room for alien/dinosaur/big robot action. Jim Lawson's art is kind-of odd, though. In places it's great, but he has trouble with noses. But even better is the "Tales Of The TMNT" series, with revolving artists/writers for each issue. They even got the two guys that did the Archie Turtles comic to come back and do a couple of guest spots. The source seems to've dried up, unfortunately, so I'm way behind on them at the mo. That ... is just way too much mayonnaise. It's like the comic has matured but still has plenty of room for alien/dinosaur/big robot action. No! I think they've aged in real time, pretty much. I still have a big batch of the Mirage TMNTs; what always impressed me most was their willingness to let other creator/artist/writers have their way with these iconic figures well in advance of DC's elseworlds style play... great runs with Rick Veitch, Hedden and McWeeney, Mike Zulli, Mark Martin. I remember a demented Chester Brown issue with a villain called the Fanny Whacker. Can this be right? He looked like the Punisher, didn't he? No, it was Mark Martin. actual real true fact: CEREBUS crossed over into the original TMNT comic! Australian usage is UK-ish, thus making the big Punisher-dressed rat a surprising proposition. Raphael is ... weirdly big now. He's supposed to be small, fast and dangerously insane. Nah, he works out. More than the others.